West Coast Swing beg, intermed & technique classes with Steve Ryan (& Me) Monday nights. New round of classes starts about every 4-5 wks – see Class page. Steve and I teach every year at this fabulous music and dance camp in the Catskills. A warm, friendly and welcoming place to learn new skills and sharpen old ones. Amazing musicians play dances each night and teach classes during the day, several dance instructors, including Steve and I teach classes too. Set in the beautiful Catskills with great outdoor activities. Enjoy great tasting food 3 meals a day and a night time snack at the dance break. A wonderful way to bring in the new year! Highly recommend it! A week long music and dance camp in the Catskills! Steve and I have been teaching for many years at the Western & Swing dance camp. I highly recommend this music/ dance week! 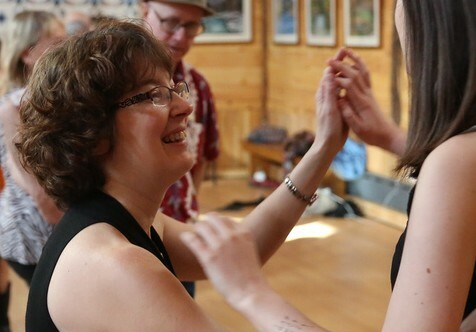 It is the most warm, friendly and welcoming place I have ever known to learn and enjoy dancing and music. There are a wide range of music and dance classes during the day taught by talented professionals. Steve & I usually teach West Coast Swing, Slow Dance and Western Swing, other instructors teach East Coast Swing, Lindy and solo Jazz. Amazing musicians play dances each night. Set in the beautiful Catskills with great outdoor activities. Enjoy great tasting food 3 meals a day and a night time snack at the dance break. After a full week of dancing every day in classes and social dancing at night your skills will move to the next level.